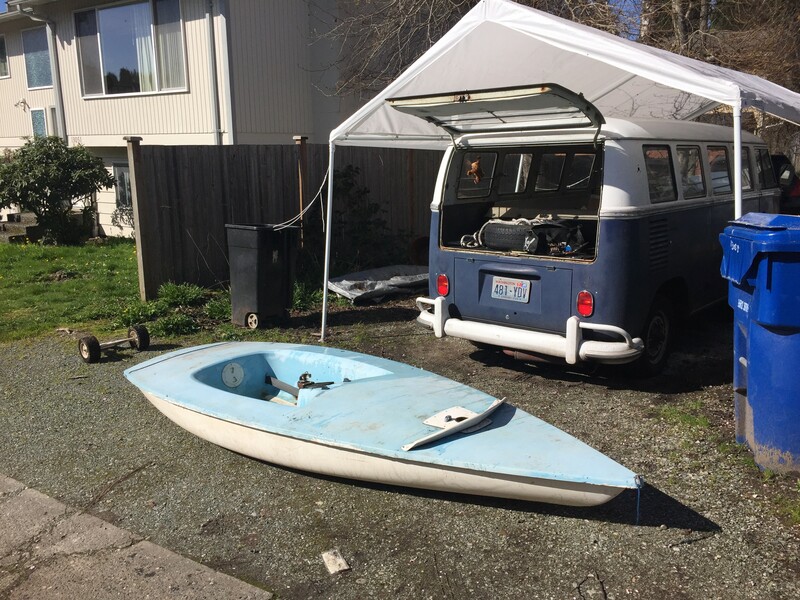 Update: A couple readers who know about the Barnett Max have contacted me to let me know that the boat is actually from the 70s. Seems I was a bit off on my timeframe! Thank you to the diligent sailors out there for the correction. My buddy Robert Dall is in town for the SBYC Snowbird sailboat race this weekend. Robert is an avid Laser sailor and racer from the Sunshine Coast in Canada. Near the end of last year I was given a “laser-like” sailboat by another boater in my marina. It needed some work to get it worthy of being on the water again, namely redoing all the adhesive around the hull joint. Well, she is done and ready to start getting some sailing in this summer! Robert had not seen her in real life so we pulled her out from her winter storage and rigged her up. Robert gave me some great pointers from his Laser experience on how to optimize the rigging and sailing. The boat is a Barnett Max. It is very old. I think possibly from the 1950s. It is very close in dimensions and rigging to a Laser. I am wondering if it could be a predecessor of the modern Laser, which started in the late 1960s. Information is hard to find online about this boat. If you know anything drop me a line in the comments. I would love to hear from you! Today I ran my first sailboat race! Hi Rob – I stumbled on your Max info doing a web search for Max photos. Thanks for posting the photo of the Max fully rigged, there are very few of those, and others such as you who have stumbled onto boats that are not fully equipped need the guidance! Thanks for the great information Jim! Very interesting stuff. Glad the photos were helpful. She is a great little boat. Feel free to use the photos. I’m one of those Jim mentions above… neither I nor my boat are “fully equipped”, and in need of guidance… I have “inherited” a free MAX shell, that is largely stripped of everything, however seems seaworthy.. I’m a total novice at this, but pursuing nevertheless. (I’m an engineer, so not much will slow me down.) I’m learning from Jim that some parts are compatible with the Butterfly, so I’m going on a search for a used rudder/tiller of the Butterfly “new style” which mounts onto a single-piece gudgeon, as you have. It looks like I’ll be re-sealing the hull joint as well, using the technique you show in your video.. Thanks for that! I am going to need to locate a complete mast/sail/boom combo, or have them made to order. So I’m wondering if you can provide a few specific dimensions for me on those elements. I have a daggerboard, however, it is made of fiberglass, not wood, so it is not original. Looking forward to trying to get this little piece rigged up. Hi Jeff! I sent you an email. Wonderful littleboat! My family must have one of the originals from what I thought was mid to late70’s. I have original manual info if you’d like copy Thomaseis1957@gmail.com. Was told they were originally designed for road/regatta galleys. Toss boat in/on station wagon and drive to start point, get instructions and race….usually ending at a sponsoring pub! Like the lasers,it is susceptible to mast cup failure at the bottom of the cup. Keep the plastic mast protector (bottom of mast insert that keeps mast from filling with water) in place and mast cup free of sand. This keeps the mast from”grinding ” its way thru the fiberglass. May also cut a piece of carpet to insert into bottom of mast cup- others(laser owners) may have better sugesstions as both my max and Lazer have failed here. Repairs are tricky but plenty of info on youtube. It would be great to get a copy of the manual. I will send you an email. The photo behind the VW bus suggests that your mast cup has been repaired once….? It is possible it had been repaired once before. I had to put a new mast step in though because the adhesive gave way and nearly ripped the mast step out. The main sheet jaw cleat is an add on mine does not have. Same with aft porthole access. I have taken the Mask & Boom and Sail from a Max Sail boat to use on my Sailing Dory 12′ Sail Boat. Since the Max uses a Sleeve style Sail that fits over the Mask – question is how do you let the wind out of your sail? How do you dump the air? The first easy way is to let off the vang if you have one. It will introduce twist and spill air. The second is to simply let the main sheet out. Letting the sheet out will also spill off air. In most sailing material you will see nice tight sails, but what you really want is comfort and control. Sometimes having a dirty looking sail with a back bubble in it is a good fast sail! I got the same boat as in your picture at a yard sale. The rigging diagrams are nice but not that easy for my sister and I to clearly make out. Do you have anything else showing how the rigging is done or how to store the rigging afterwards. We are struggling and could use some assistance. Congrats on acquiring a neat little boat! The rigging is fairly simple. The front of the sail is essentially a sock that slides down over the mast. After that is on there should be a hole somewhere in the bottom front to tie the sail to the boat. You want to do this for both shaping the sail as well as keeping the mast in the boat when you inevitably flip it. The back of the sail has a clew that ties down to the end of the boom. Mine had a track on the boom that allowed you to easily move the sail in and out, this is called an outhaul. You need to get the sail tied down in the back somehow to make the sail useful. The mainsheet is the trickest part. There should be a pulley on the back of the boom with a solid stud in it. Tie one end of the sheet to that and lead it down to the pulley that should be attached to a line that crosses the back of the boat. From there it goes up and through the pulley on the end of the boom and leads forward (to about the middle of the boom) and then down. You will either have a cleat to run it through to help hold it there, or you will hold the sheet in your hand while sailing. Thanks for the post! 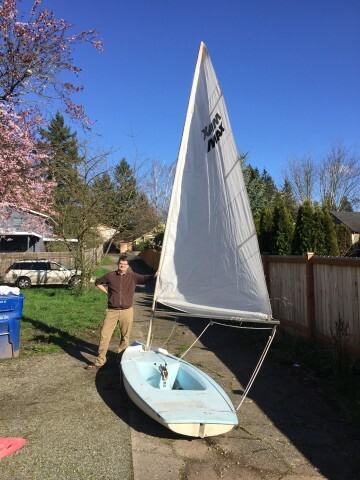 I acquired an original max sailboat 6 years ago and it has been great. I however added a main mast pulley so I’m pulling from the front. If your strong you can just tie the rope off the stern pulley. Hope this helps, I found the rope does not pull slack nicely while using the stern pulley.